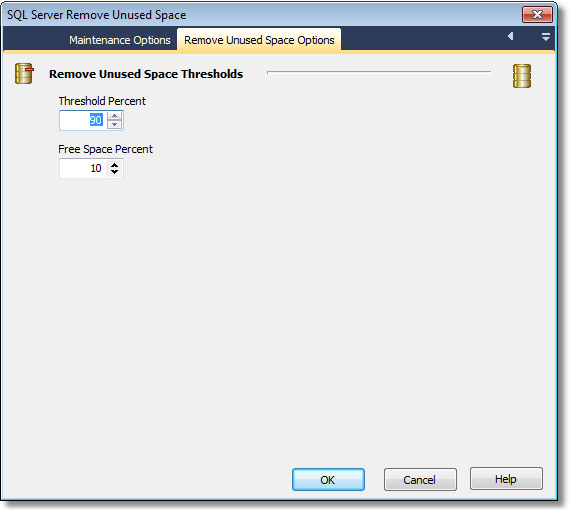 This action will ask SQL Server to remove unused space from the specified database. This option is only useful for databases that are defined to grow automatically. Threshold_percent specifies in megabytes the size that the database must reach before sqlmaint attempts to remove unused data space. If the database is smaller than the threshold_percent, no action is taken. Free_percent specifies how much unused space must remain in the database, specified as a percentage of the final size of the database. For example, if a 200-MB database contains 100 MB of data, specifying 10 for free_percent results in the final database size being 110 MB. Note that a database will not be expanded if it is smaller than free_percent plus the amount of data in the database. For example, if a 108-MB database has 100 MB of data, specifying 10 for free_percent will not expand the database to 110 MB; it will remain at 108 MB. Specify the threshold percent and free space percent (see above).